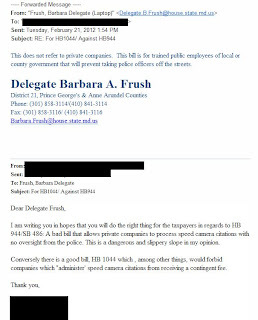 Two sponsors of legislation removing the requirement that police review speed camera citations before they are issued have claimed that it would not permit citation reviews to instead be done by private, for-profit contractors, even though both the Policy Notes and a straight reading of the bill's text clearly show that this would be the case. The legislation, named Senate Bill 486 and House Bill 944 was heard before the Senate Judicial Proceedings Committee on Tuesday Feb 21. The editor of StopBigBrotherMD.org testified that the bill would be a disaster for motorist rights, on the grounds that it would remove an important safeguard meant to protect the innocent. We argued that it would allow the final say in who receives citations to be made by private contractors. This would not only increase the chance of erroneous tickets (something this website has documented NUMEROUS examples of), but also remove accountability by local governments, and place records about citation review outside the scope of the state's open records laws (the MPIA). In the worse case scenario, the contractor might be paid based on the number of tickets issued (the same way most local speed cameras contractors in the state are currently paid). Senator Jamin B Raskin(D, Montgomery County) responded to the committee that the bill would NOT permit this task to be performed by contractors, that only employees of the government would be able to approve citations. We responded that this was clearly stated in the Fiscal Policy Note for the bill, and that contracting was specifically mentioned in the bill. "This does not refer to private companies. This bill is for trained public employees of local or county government that will prevent taking police officers off the streets." "Local Effect: Potential minimal decrease in workloads or expenditures for any jurisdiction that operates a speed monitoring system program to the extent that the bill allows local police departments to more efficiently allocate resources or to contract with an outside vendor trained in speed monitoring enforcement." (viii) A signed statement by AN AUTHORIZED PERSON TRAINED IN SPEED MONITORING SYSTEM ENFORCEMENT AND employed by or under contract with an agency that, based on inspection of recorded images, the motor vehicle was being operated in violation of this subtitle;"
The fact that local governments would be free to contract with private companies to sign off on citations seems clear both from the wording of the law and the fiscal policy notes, in clear conflict with the statements by two of its sponsors, Senator Raskin and Delegate Frush. We should probably not presume deception: It is possible that some state lawmakers do not read the legislation they themselves sponsor or the policy notes produced by the Department of Legislative Services for their own bills ( though the same bill was submitted last year with policy notes stating the same thing ). But it is little wonder that so many of the supposed restrictions on speed cameras have been bent, flouted, circumvented, and ignored when even the authors of that legislation don't know what they mean. The cities of Rockville, Gaithersburg, and Baltimore City all sent representatives to argue in favor of the bill -- presumably on time paid for with taxpayer dollars. Meanwhile, opponents of the bill supporting volunteer based groups opposing speed cameras needed to take time off work and pay their own expenses to attend such hearings, costing them money. Representatives of other government agencies appeared to testify against other legislation that day (specifically Senate Bill 57 -- which would forbid workzone speed cameras from being used when there are no workers present as is currently done), who also were presumably on the taxpayers' dime. This is just one example of the lobsided disadvantage which those arguing for limits on the power of government are placed at in the legislature. In Rockville's 2012 legislative priorities report, they specifically state a reason that the bill would save their program $20,000. The city's FY12 budget projected $2.1million in gross ticket revenue for FY11. Speed Camera Contractor ACS once bragged in one recorded town meeting in Frederick City that reviewing a speed camera citation takes "less than 20 seconds" of a police officer's time. Obviously twenty seconds is clearly too much time for a law enforcement officer to spend ensuring the integrity of a law enforcement system, so for the sake of ONE PERCENT of their gross ticket revenues Rockville is willing to eliminate what at least should be a vital safeguard protecting the innocent. But remember folks, speed cameras are about safety, not revenue. The other sponsors of SB486/HB944 were Delegate James W. Hubbard (D, Prince George's Co), Delegate Barbara Robinson (D, Baltimore City), Senator Jennie Forehand (D, Montgomery Co), and Senator James Rosapepe (D, Anne Arundel & Prince George's Counties). 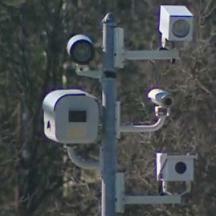 StopBigBrotherMD.org has prepared a legislative summary of photo enforcement bills being heard in the 2012 session, including our analysis whichis based on MANY hours of research into speed camera law and consultations with other motorist organizations.